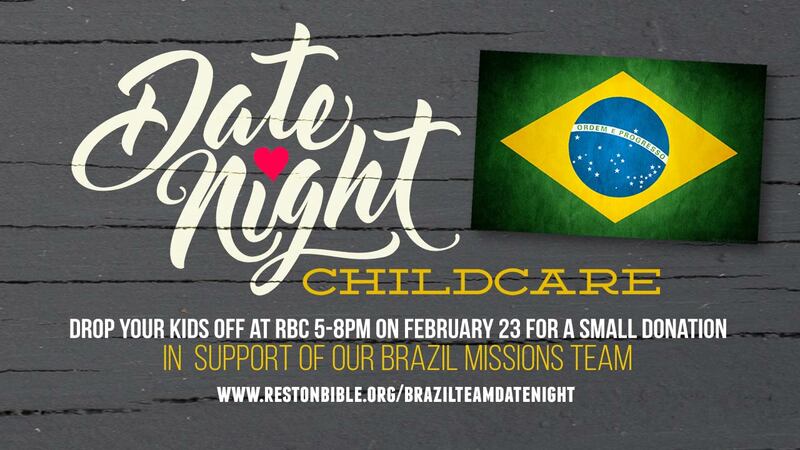 Support the Brazil Mission Team by letting us watch your kids while you go on a date with your spouse! What? The Family Quest parent and child mission team to Brazil needs to do some team building before heading out of the country, and we also need to raise funds for materials in country. When? Saturday, February 23, from 5:00 to 8:00 p.m. at the church. Drop-off is at the Quest Desk. Why? The Family Quest parent & child mission team to Brazil needs to practice their games and crafts before heading out of the country and we also need to raise funds for materials in country. How much? We are asking for a minimum suggested donation of $30/family. This is based on the estimated value of sitting in this area. Any amount over $30 (and we would love to see that!) is tax deductible.